Her parents named her Dorothy Albritton, when she married she was called Mrs. Wallace Laird, her close friends called her Dot...I called her Oma, a German affectionate nickname for grandmother, sort of like Granny. Oma was my mother's mother...and as you can see from this picture of her as a young girl. Oma was a beautiful woman who was always conservatively stylish, from birth to death. In the 1960's this included what I call taxidermy hair. This was a popular style of the era which involved going to the beauty parlor once a week, having her hair done and through the miracle of Aqua-Net, in the purple can, was made permanent...at least for a week, until the next appointment with Gail the following week. She followed Gail around town from salon to salon until her death (either her own or Gail's, whoever came first). Two of the places were named 'The Beauty Box' and 'Curl Up and Dye'...she thought the latter was tacky, but Gail was there and so she went. A main component of all of this was that she had a 'standing' appointment. She never missed a standing appointment for any reason on earth...if she was in intensive care, she would check out of the hospital, have her hair done, and return to ICU. It's the way it was done in those days. The nurses, with their own stylish bullet-proof hair, understood and would keep mum. I can remember as a young boy watching this process a couple of times. I would sit in a pink leatherette chair, reading magazines, while a rather remarkable process occurred...you would think for an eight-year old this would have been an exercise of total tedium. Far from it. First they would 'wash' her hair. This 'wash' had a tinge of auburn coloring in it...but she never had her hair dyed, it was 'washed'. She would never admit to dyeing her hair. It was 'washed'. "Washed." Stage two brought in the curlers, small pink ones all over her head...much more feminine than having ones made with say a khaki-green GI Joe commando theme...all part of the process. Then she sat down in a chair under the dryer that fit over her head like a knight in armor headgear...you knew she was dry when small curls of smoke started to come out from around her ears. Fanning her hair to get the last of the smoke out of it, Gail would gently undo the curls, leave them in place, then spray a heavy coat of Aqua-Net all over them. Once that was dry...it took between 10 minutes to an hour...Gail would grasp each curl, stretch it out, then backcomb the hair...also known as 'ratting' it. To me this was the crowning moment. Once Gail had ratted her hair, it looked as though she had been plugged into a 220 amp plug...it stuck straight out from all over her head all. It had a sort of 'trick or treat' look at this point. Then came the combing, the brushing, taking this Bride of Frankenstein theme into one of smooth waves all over her head...how Gail was able to achieve this was remarkable, but it truly became elegant. Depending on Gail's mood of the day, sometimes it was rather close to her head, other times was grander, higher, with layers lifting towards the heaven, in what my daddy used to call 'a gather-by-the-river hairdo', the classic beehive, bouffant so popular at the time. Once this was done, there came endless coatings of Aqua-Net. The final result was always beautiful, although it did have certain taxidermist feel about it. It was rock-solid...truly bulletproof! A tornado could have hit her in the parking lot, blown every inch of clothing from her body, but that taxidermy hair would have been in place. Back to Gail's mood, sometimes the bouffant was so high she could barely get it into her Buick, but that was not usually a big problem. This was usually dependant on Gail's blood sugar levels of the day. Oma always brought her some Toast-Chee peanut butter crackers to slip her before it all got started, along with a small Coca-Cola in a bottle. That would stabilize her. The problem was how to keep this bouffant in place for the next seven days...it involved wearing a 'snood' over it all while she slept. Should she not be able to find the snood, a pair of satin-like underwear worn over her head would work in a pinch. It was unfortunate if she forgot about the underwear and didn't remove it before she would cook breakfast wearing it and her robe as she scrambled eggs and made coffee...a style sensation I still can't get out of my head. The hair would remain rock solid, until it was time for her next standing appointment the next week. 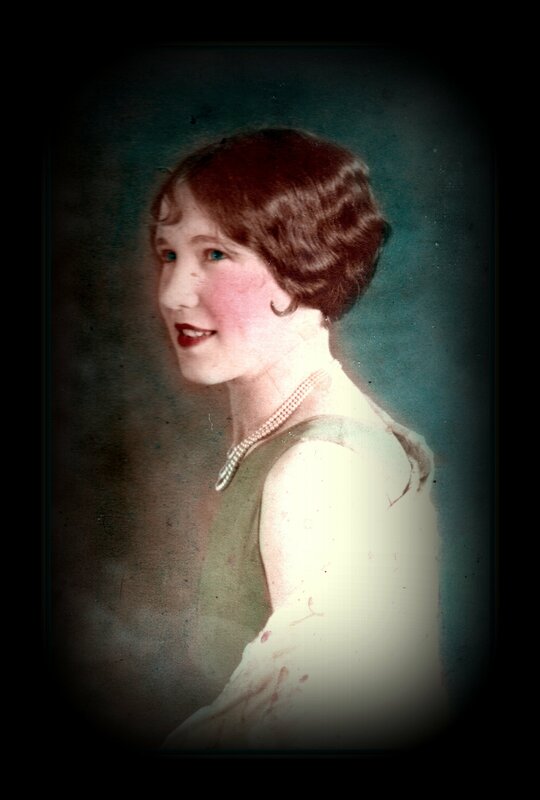 Taxidermy hair worked for so many women of the era, and Oma wore hers with a lot of style and grace. The remarkable thing is that in photographs during those years, it always looked the same, not a variance from year to year, curl to curl. The Aqua-Net certainly did the job...she should have bought stock in it!